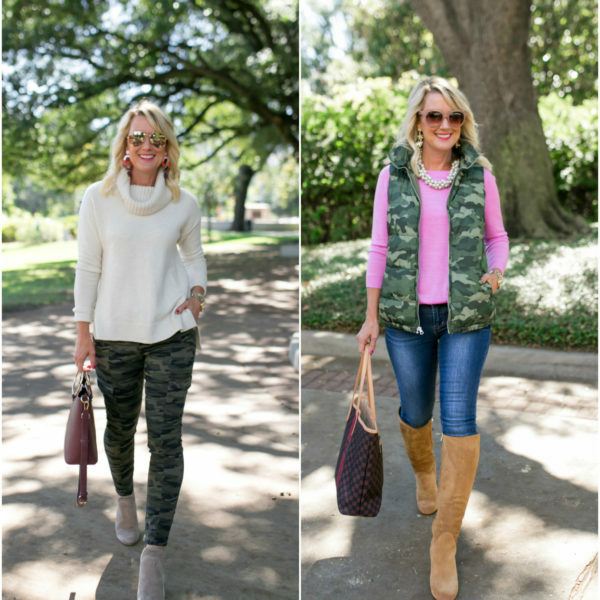 Fall Style | Cozy Meets Chic | hi Sugarplum! Welcome back to a new week, friends! How was your weekend? We had non-stop sunshine, and it was glorious! I definitely have Fall Fever now, and am ready for all the booties and sweaters. Holidays are practically around the corner, too, so I’m getting excited to share fun inspiration for home and style. Today we’re talking about cozy though. Usually when I hear the word ‘Cozy,’ I think fluffy pullovers, oversized sweats, and snuggly pajamas. Basically, loungewear for a date with Netflix and my sofa! But what if you could be dressed in cozy, but look effortlessly chic!? Sign me up, right?! Well, my friends Gibson and Living in Yellow have mastered the art of cozy chic in their new collection launching now at Nordstrom! I was lucky enough to snag some pieces early, and couldn’t love them more! 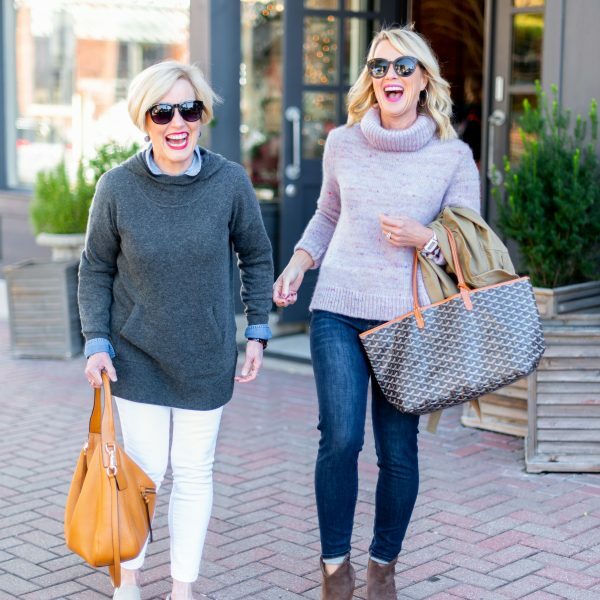 Here are 3 Ways to wear cozy, and stay chic. 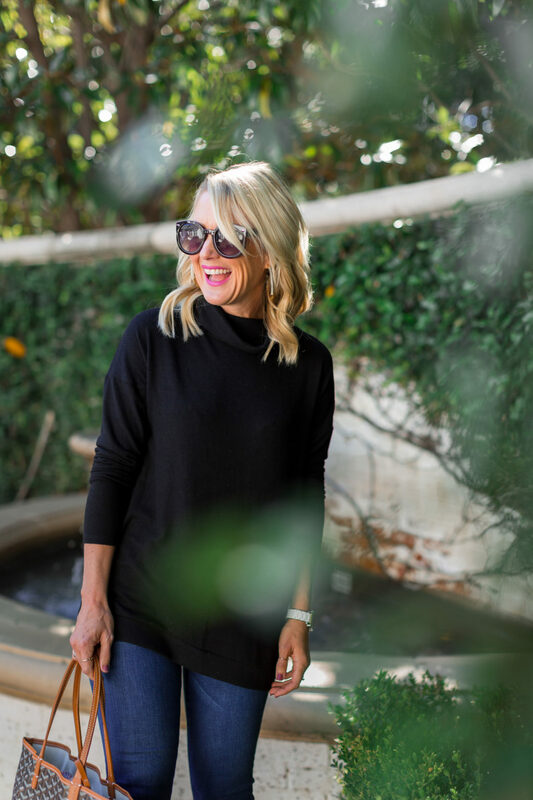 I love any opportunity to channel my inner-Flashdance, so this one-shoulder fleece pullover is one of my faves from the Gibson x Living in Yellow Collection. It’s fleecey soft, like only Gibson does best, with a relaxed fit through the body, but closer through the arms to keep it from being too slouchy. It’s also long enough for leggings! I paired it with my fave bralette for a little extra sass…but it can also be worn fully off-the-shoulder on both arms. It comes in several great Fall colors (and even leopard! ), but I was drawn to this punchy magenta. Recognize the belt from last week’s Amazon Fashion Finds post? This was definitely a reader-favorite, so a lot of us will be styling our new belts this Fall! It adds so much to this simple outfit, don’t you think? I love that it’s reversible, too (and only $15!). For a little more punch, I added the darling plaid scarf to the mix. See how I tied it in this How To post. 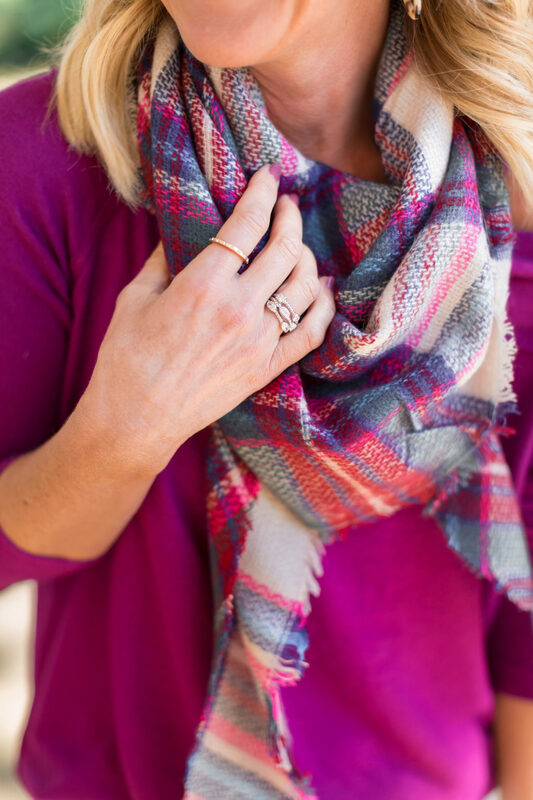 Sugarplum Style Tip: Blanket scarf too bulky? Simply fold it in half diagonally, and cut down the fold. Voila! Less bulk, plus an extra scarf to gift! I don’t even sew the edge, just roll it up and you’re good to go! Okay, for a second look…let’s take our cozy fleece out for Date Night! This faux-wrap top is in the softest fleece, but drapes beautifully. Layer it with a cotton tank for casual day, or a lacy camisole for evening….either way, you’re cozy and comfy! 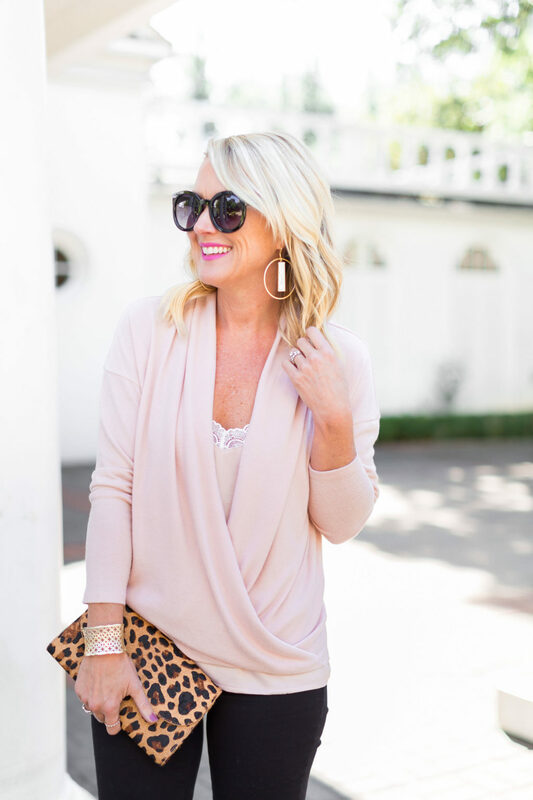 I paired the wrap top and camisole in blush for a tone-on-tone look, but you could go with any number of color combos. I love the little peek of lace, and the satin is soft and thick. Fit Tip: I’m wearing XS in both. These jeans feel more like pajama pants than denim, so I’m taking the cozy one step further. They’re crazy soft and super stretchy…like leggings, but thicker and with pockets! Fit Tip: Size down, they run a little big and stretch out some. 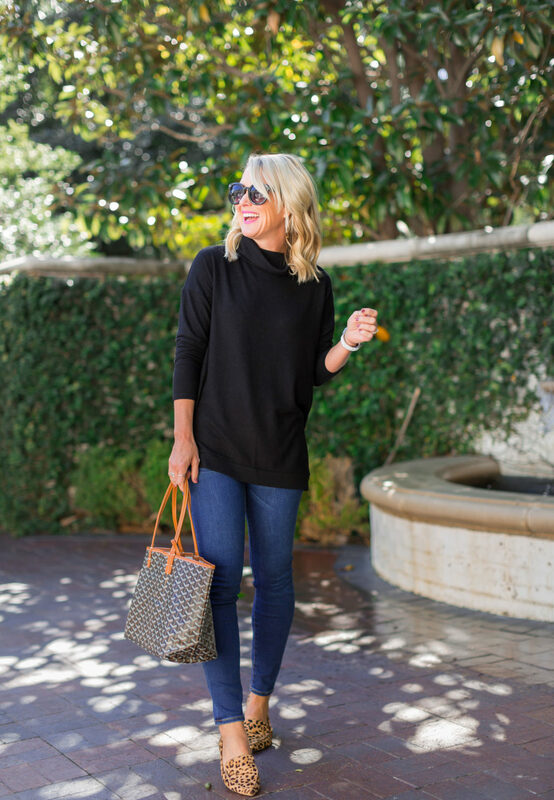 And finally, what’s become my daily uniform…a cozy pullover, ankle jeans, and stylish flats. Leopard, of course! 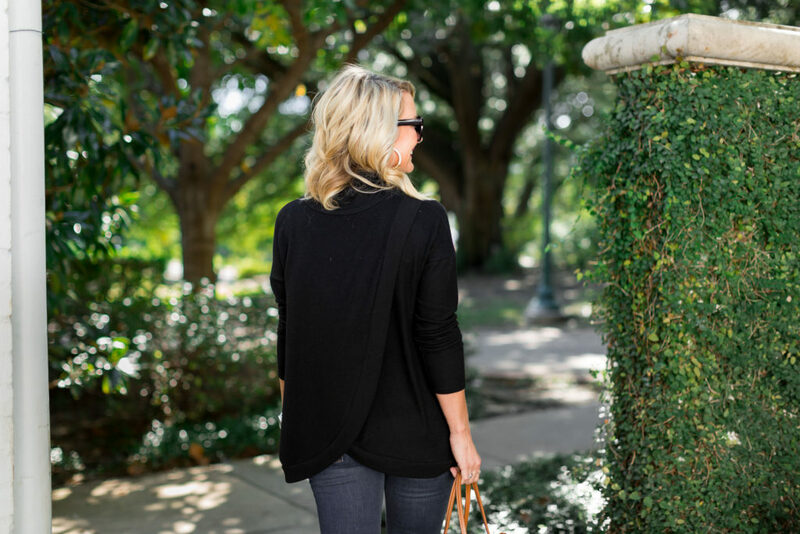 I can’t get enough of this cozy fleece pullover tunic with layered look! I have it in several colors now, but reach for the black for an uber-chic style. 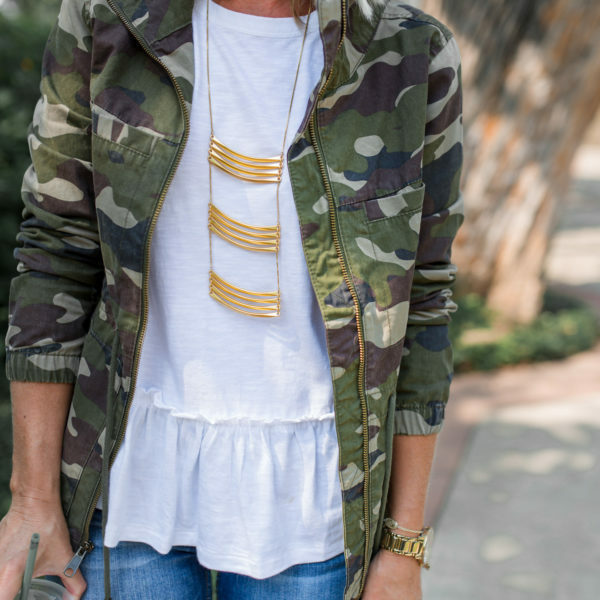 I love that it’s reversible, too…wear the layer in the front or back! Fit Tip: I’m wearing an XS, and it fits me like a tunic. 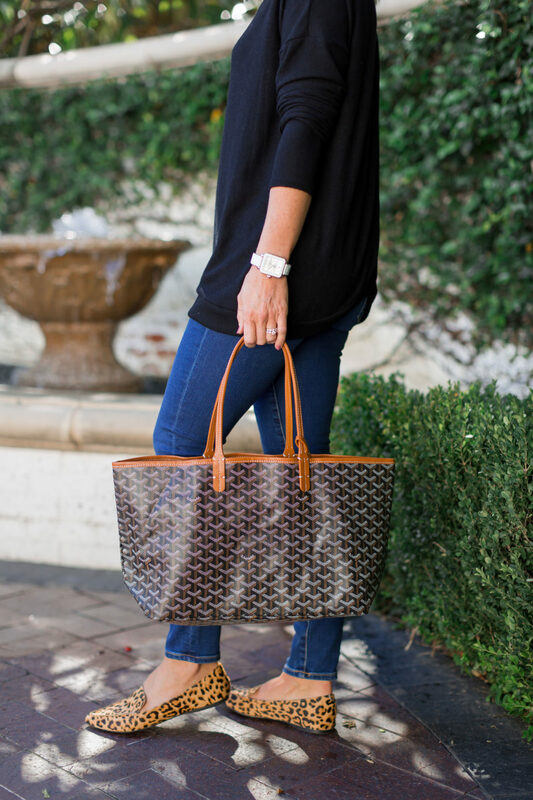 Another great Amazon find…this logo tote for under $50! It’s a great size for every day, and the canvas sturdy enough to hold its shape. It even comes with a pouch and duster bag! 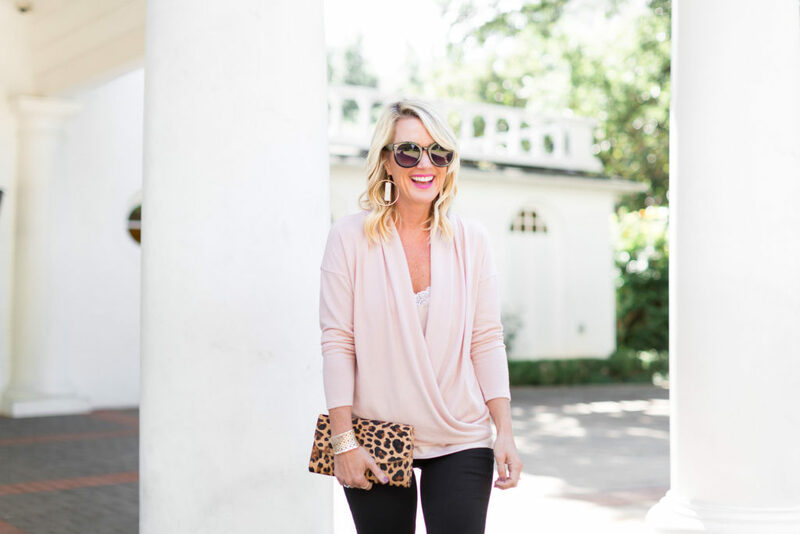 You’ve seen a lot of these leopard flats lately, too….they’re just that cute and comfy! 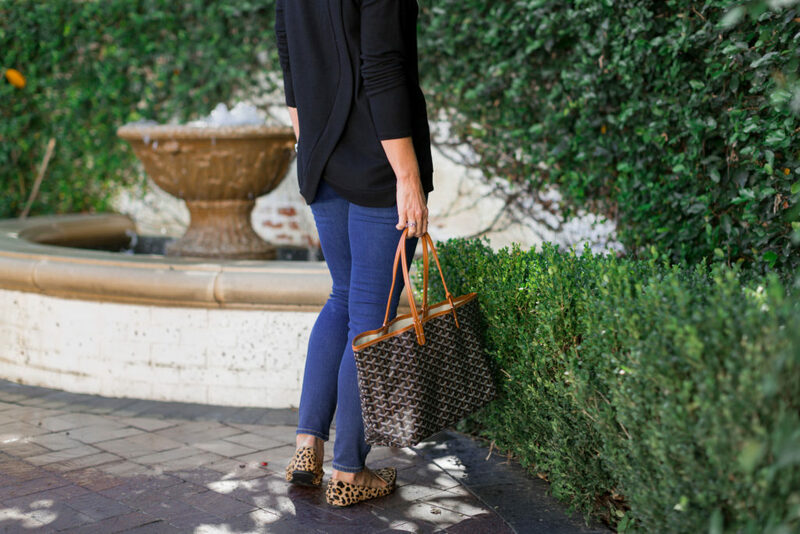 Fit Tip: Leopard flats true to size. Of course you could wear any of the pieces with jeans and sneakers, or even these amazing joggers, too! 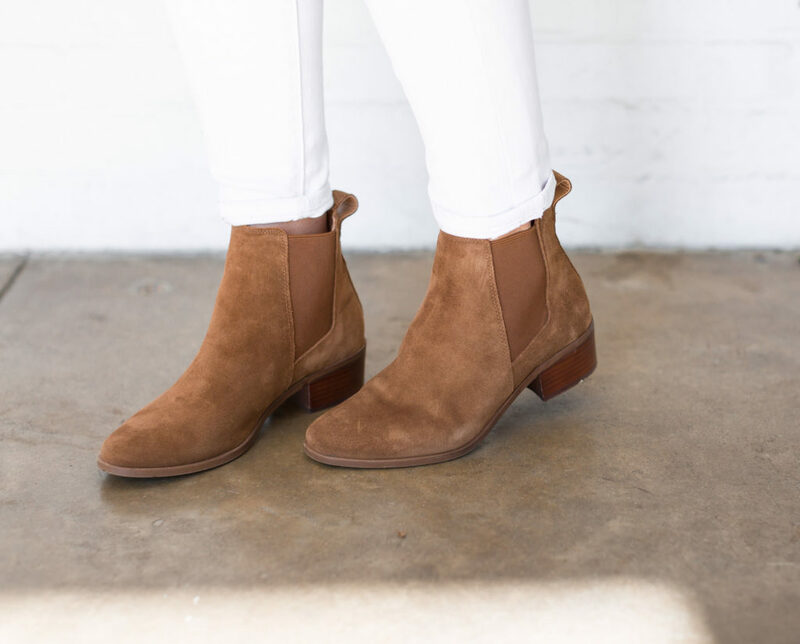 But I love to find ways to wear my comfiest pieces in a more chic, every day style. Congrats to my friends Gibson and Living in Yellow for another amazing collaboration! Find it all here. How do you wear your cozy? Which of these outfits most closely suits your style and way of life? 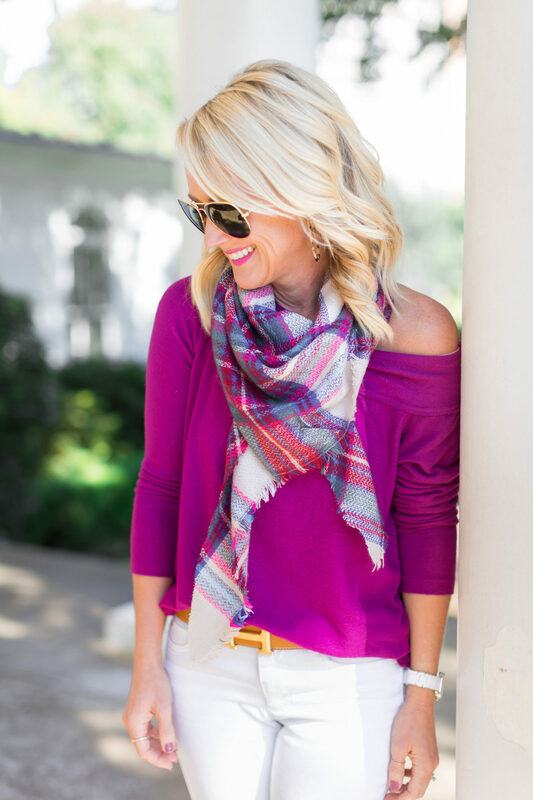 When you added the plaid scarf to the fuchsia top-WOW! And those blk. patent leather sandals, oh yeah. Thinking about some booties finally. Black suede……. 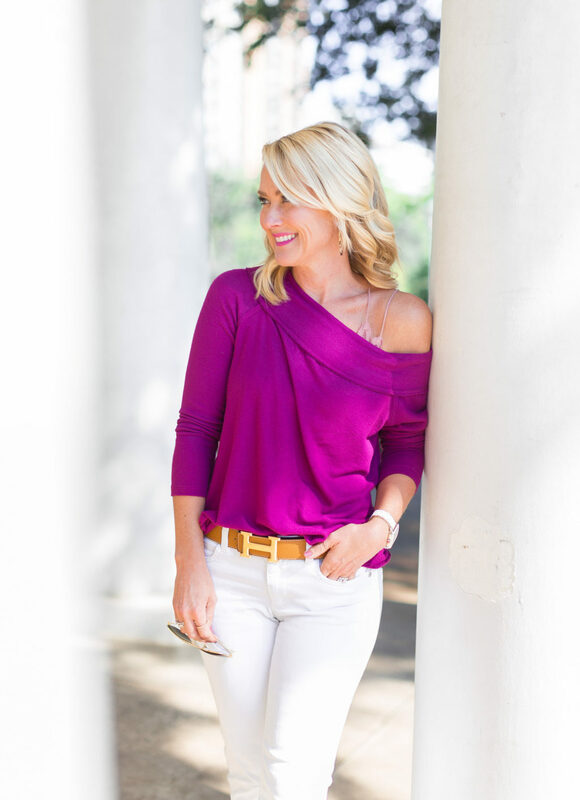 That purple looks great on you, but I love you in that blush pink wrap top! I have the black and know I will wear it all the time, but the blush sure is pretty! 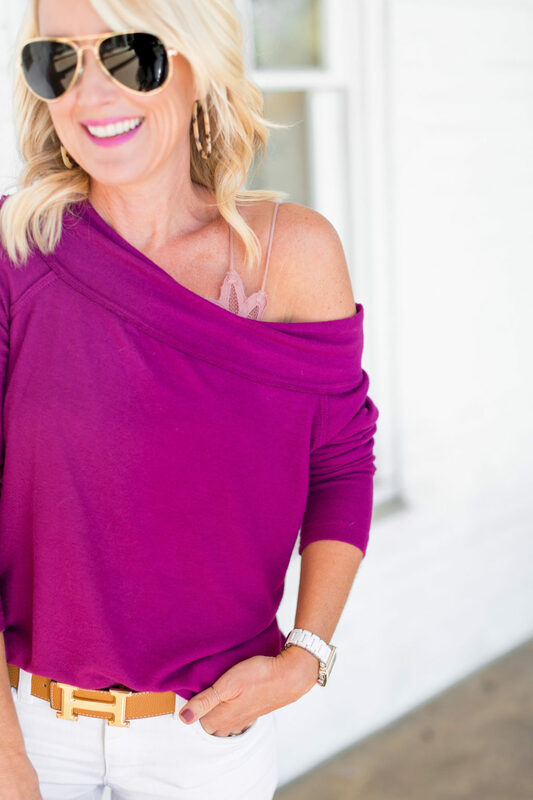 LOVE, LOVE, LOVE the color of the Magenta top! But on the Nordstrom site it looks Raspberry colored…is the color named Deep Violet? 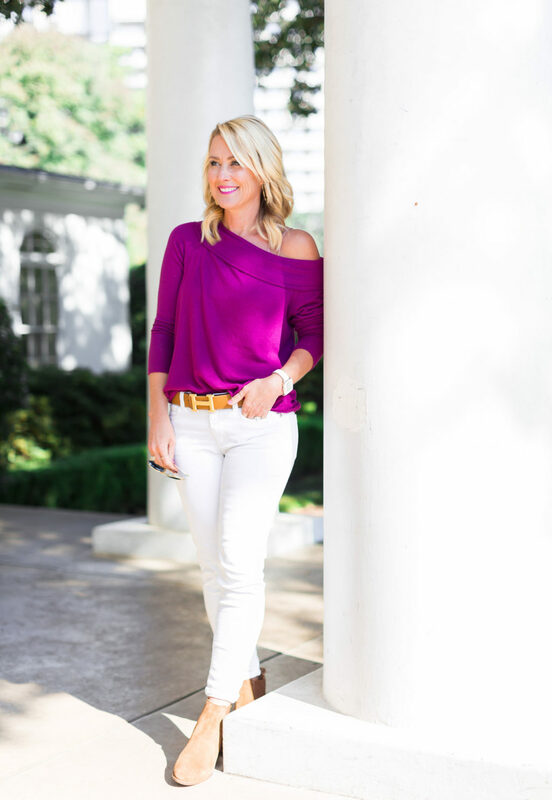 Yes, I’m wearing the violet…it’s kind of dark on their site! 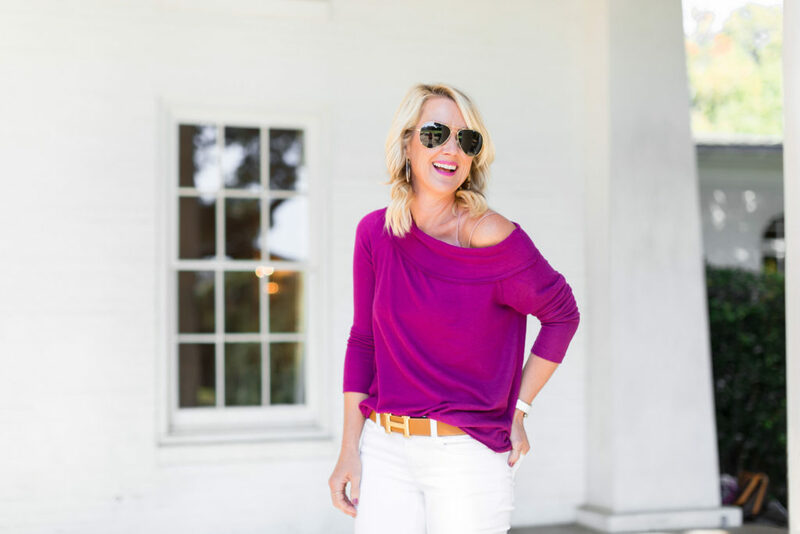 Love the colors that you put together in the off-the-shoulder pics. Is the color of bralette purple? Thank you! My bralette is the rose one…it’s a great neutral with a touch of color.